his is the critically endangered Tiburon Stream Frog, on Grand Bois Mountain, Haiti. In a race against time, an American professor and a Haitian CEO have teamed up to establish private nature reserves to protect Haiti’s disappearing species. Now, with funding from Global Wildlife Conservation and Rainforest Trust, the first such park has been purchased: Grand Bois, a mountain in the southwest of Haiti with rare and endangered plants and animals. “The native species of plants and animals in Haiti need greater protection,” says Professor S. Blair Hedges, director of Temple University’s Center for Biodiversity, who has been surveying, with helicopter, the last remaining tracts of Haiti’s original forests before they disappear. In November 2018, he and his team reported, in the Proceedings of the National Academy of Sciences, that Haiti has less than 1% of its original primary forest and is going through a mass extinction of biodiversity. However, they identified a few remaining biodiversity ‘hot spots’ where original forests and their species still exist, including Grand Bois. His partner in the effort is Haitian businessman Philippe Bayard, CEO of Sunrise Airways and president of the leading conservation group in Haiti, Société Audubon Haiti. Since they teamed up nine years ago, Hedges and Bayard raised public awareness about Haiti’s disappearing species through videos, brochures, public lectures, and a documentary film. Haiti’s government took notice. In 2015, Haiti declared Grand Bois a national park, identifying it as a priority for conservation and validating the critical need to acquire and protect the area. Parks were also created for Deux Mamelles and Grand Colline, other mountainous hot spots in southwestern Haiti. There are, however, limited resources from the Haitian government for protection of these large and remote areas, whether publicly or privately owned. To assemble the mountain tracts, Bayard and Hedges sought donors to purchase private land and help pay for park management. Two experienced conservation organizations, Global Wildlife Conservation and Rainforest Trust, joined the effort. After delays from government instability in the last two years, the Grand Bois purchase was completed on January 18 of this year. “It is a jewel of biodiversity with about one half of the orginal forest intact above 1,000 meters of elevation,” explains Hedges, “Its more than 1,200 acres holds at least 68 species of vertebrates including some found nowhere else in the world and plants and animals previously thought to be extinct, such as Ekman’s Magnolia tree and the Tiburon Stream Frog. A first step in managing Grand Bois involved creating a nursery for the magnolia trees, with technical assistance from Fundacion Progressio, an NGO in the neighboring Dominican Republic. For decades, Bayard and Hedges have witnessed the continual degradation of the environment in Haiti. “Sadly, conservation efforts in Haiti were not producing convincing results and therefore the current system of protected areas is not working. Something different was truly needed,” said Audubon Society of Haiti president Bayard. He knew that a new strategy was necessary and a private trust fund was the answer. As a result, the pair recently founded Haiti National Trust to preserve the country’s natural environment and biodiversity. “We are trying to embark on a new direction for biodiversity conservation in Haiti,” said Bayard. Morne Grand Bois is found in Haiti’s Massif de la Hotte mountain range, the number one priority conservation area in the country and one of the most important areas for amphibians in the world. Because 19 amphibians here are critically endangered, the Massif de la Hotte is an Alliance for Zero Extinction site and also a Key Biodiversity Area, which is a nationally identified region of global significance. 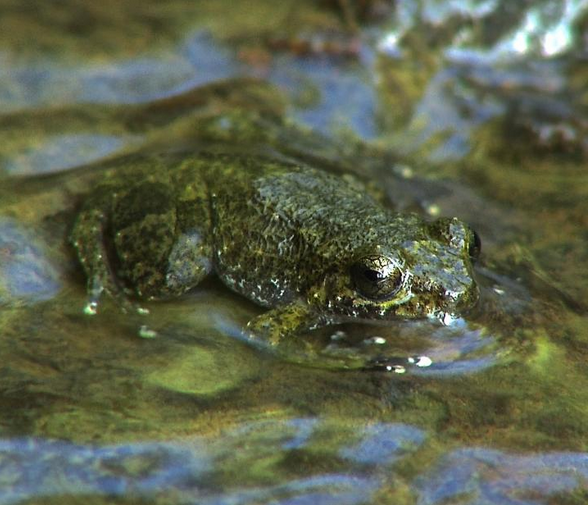 In addition to his research and conservation work in Haiti, Hedges has collaborated with the Philadelphia Zoo to keep alive and/or captively breed the most endangered frog species still found in the country. As head of Temple’s Center for Biodiversity, Hedges coordinates research that seeks to understand how species evolved, what species currently exist, how species interact with each other and the environment, and how scientists and society can save species from extinction. The purchase of Grand Bois was made possible by a generous donation from the Sheth Sangreal Foundation (through Global Wildlife Conservation) and from Rainforest Trust.